Hot this week: After over 40 years, and after some surprising plot twists, the Motunui panels returned to New Zealand. Shameless promotion of my project’s work to the top of the list. There will be more of it in several languages further down. I am sure this would be a worthwhile read if it wasn’t behind a paywall. Did a Mexican antiquities collector *really* get into a small plane with strangers, fly into the jungle, and buy rare Maya artefacts on a remote airstrip? The countries are teaming up to study Treasure Fleet shipwrecks and hopefully protect them from looting. There was a plan created to protect the site in 2007, but it hasn’t been enacted and the site has already been looted. Ecuador and Costa Rica sign a bilateral agreement to prevent the trafficking of cultural property between the two countries. Long but worthwhile piece on Peru’s recent efforts and successes in the return of cultural property. The massive adobe site of Cahuachi is in need of preservation. The site only has one guard and it has been looted. Matisse’s Odalisque in Red Pants was stolen from the Venezuela museum of Contemporary Art in 2002 and replaced with a fake. Two people have pled guilty in the US on charges related to the transportation and attempted sale of the piece in Miami. They tried to sell it to undercover FBI agents for $740k USD. 72 of 82 pieces stolen from the Efrain Martinez Museum House in Popayan were recovered by the police. They were stolen in October of last year and several museum staff were overpowered in the theft. Apparently the recovery was made because of the recent dismantling of a Colombia/Ecuador criminal gang. The Bureau of Land Management in Utah houses around 200k items that have been seized in raids (and presumably came into their possession other ways) and are trying to return them to the correct Native American groups. Because the items are looted they are having serious problems with this task. They hope that publicizing their effort will make the public more aware of the damage looting causes. Inept thieves fail to steak $18k painting because it was larger than the doorway they tried to move it through. Scheme netted $1.9 million for around 60 fake Pollocks. One born every minute. Salah Salahadyn pleaded not guilty in February to being a party to felony robbery but scheduling problems have postponed his hearing. The 254-year-old carved piece was stolen sometime in the mid-20th century then found by a child who would later a) become an anthropologist and b) return it to the museum. A reliquary containing a sliver of toe bone from Saint Faustyna Kowalska has been stolen from the Basilica of Saint Mary Star of the Sea. The Norton Simon Museum has problems on all sides it seems. This time they are a Cranach pair that are linked to Dutch Jewish art dealer Jacques Goudstikker who lost them to invading Germans in 1940. The ever erudite Dr. Kwame Opoku provides you with everything you need to know about the recent returns to Nigeria. Dr Opoku (like most of us) was quite surprised to see the Museum of Fine Arts return anything, let alone Nigerian objects. Any article he publishes is worth reading. Objects seized from looter gang’s home in Abu Sir village, Giza. They were meeting to discuss bilateral cooperation against antiquities trafficking. This amazing Egyptology document which details, among other things, the work of Napoleon’s archaeologist, was looted during a fire that broke out during riots following the 2011 revolution. The pages were found in 7 packages on a flight to Kuwait via Frankfurt. 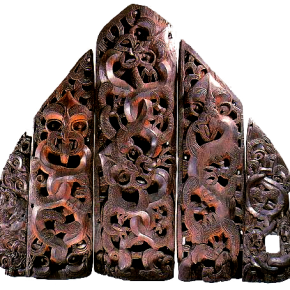 These amazing carved panels were hidden by Maori fleeing wars in the 1800s, discovered in 1972, trafficked to the US and sold to collector George Ortiz. Ortiz then tried to sell them at Sotheby’s to raise money to pay a ransom for his kidnapped 6-year-old, however New Zealand attempted to have the stolen panels returned in a high profile court case without success. They have now, essentially, paid a ransom to Ortiz’ heirs to get their own stolen property back. This is the whole story. A news report on the Motunui Panel return but, really, my blog entry has the full story so, you know. A 140-year-old ancestral Chinese tablet which was removed from the Joss House Museum when the building was derelict has been returned. A rather general piece on antiquities looting and trafficking that repeats the tired and likely not true Muhammed Atta thing. From the folks at The Antiquities Coalition. A mention of the Trafficking Culture project. The trade in Syrian cultural objects is hot, despite various embargoes and restrictions. There is also audio on this one. Nothing had changed since the last high profile Hopi auction. Hopefully the publicity will spoil the market a bit. Probably an interesting article but unfortunately behind a paywall so who knows. The trial of three men involved in looting a necropolis that they discovered by accident in Sicily is being restarted because of various court things. The men claim they were, ahem, only HOLDING the objects for a little while so that they could turn them over to the authorities. Various provenance researchers grumble about how terrible art dealers and auction houses are about helping to deal with Nazi-looted art. Add in museums who absolutely wont speak to you, even about things that went on decades ago, and that is my experience too. Germany has returned one of 30 19th century icons that were stolen from the Church of St Nicholas in Chernopenye. The piece was returned with the help of Interpol but there are no other details offered. Probably the most unbelievable thing I’ve read this week. This teacher decided it was a great idea to actually *DIG* at Auschwitz to find artefacts to show his class. Well I should hope so. He has already paid some money but will have to pay more. There should be some extra fine on the top for being unimaginably idiotic. Seriously, this is about the stupidest thing I have heard recently. Thank goodness they are leaving the boring, bleak, nap-time of an exhibit hall they are in (in all honesty, I fell asleep in there once), but they sure aren’t moving to Athens. A duo of underwater looters who pillaged WWI, WWII, and East India Company wrecks have been fined £7k and £6.5K respectively and ordered to pay costs of £25k each. This is the first prosecution of its kind. A 15th century piece by Guidoccio Cozzarelli is being returned to claimants after it was found to be part of a 1936 forced sale. Yes that trove of Warhols and Harings you found on eBay is too good to be true. A London gallery owner learns his lesson after buying piles of fakes. Okay, I am a broken record on this one, but this is more coverage of the Trafficking Culture project’s work in Cambodia. The same article only in Vietnamese. Yes, let’s! Behind a paywall but you can see *just* enough to know that Trafficking Culture was name-dropped. For whatever reason Trafficking Culture’s work was picked up by a physics news site. Pretty cool! A great long article in French about the work done by Trafficking Culture. Probably the one to read if you are a French reader. The same article, only in Russian. The Khyber-Pakhtunkhwa Directorate of Archaeology and Museums has launched a website with the hopes of raising awareness about the region’s archaeological treasures. The area is heavily looted and a reported hotbed for antiquities smuggling and they are hoping that more awareness will reduce trafficking. Local municipal council and the archaeology department are meeting to decide what is to be done about several ancient sculptures recently found in the Panchganga river. At least two of the idols have already been stolen from the riverside in the past week, although the archaeologists said those have little historic value. Thirteen other pieces have been moved to a site where they can be protected. Locals and archaeologists are very concerned that other items emerging from the river will be looted and trafficked. Pre-1790 icons hit in this church. Only the ivory parts (hands, faces, baby Jesus) were stolen so it is pretty clear what these thieves were after. An amazing turn around, the pieces were found! A suspect caught, a confession secured. The thief apparently had escaped twice from the local jail in the past. This is not the first time these objects have been stolen and recovered. Museum’s officers examine and seize 15 antiques that were illegally salvaged by locals from a shipwreck. Seoul Arts Center tightens security for an Edvard Munch exhibition because, as well know, Munch artworks almost steal themselves. Lee Hae-kyung, wife of Tony Yang chairman Hyun Jae-hyun and daughter of the company’s founder, is suspected of selling of a number of artworks in her possession that were actually subject to a seizure order as part of a stock-price manipulation investigation. The Agency for Cultural Affairs has announced that 109 registered historic items are unaccounted for out of 10,524 artefacts that have been designated and listed as national treasures. The figure is likely to grow and quite a few of the objects are historic swords. To quote the article “many owners often sell historical swords on the antiques market or pass them on as an inheritance without notifying the commissioner of the change of location”, possibly because they don’t know the law. I can’t emphasize enough that this horrible, women-hating beast has one of the world’s largest collection of ‘Biblical’ antiquities. I have wonderfully indulgent waking dreams of him being taken down for buying illicit antiquities. If anyone has a supportable story about him buying terribly looted things, I would love to write it up for this blog. Get in touch.